Dr. Sophia Hayes is an Associate Professor in the Department of Chemistry at Washington University in St. Louis. She received her Bachelor’s degree in Chemistry from the University of California, Berkeley and worked for a few years afterward as an associate for a management consulting firm specializing in energy efficiency, environmental assessments, and energy generation. Sophia interned at the Sandia National Laboratories before entering graduate school. She received her PhD in Chemistry from the University of California, Santa Barbara. She then completed a Directorate Postdoctoral Fellowship with the Lawrence Livermore National Laboratory and UC Berkeley. She also served as an Alexander von Humboldt Postdoctoral Research Fellow in the Department of Physics at the University of Dortmund in Germany before joining the faculty at Washington University. Sophia has received a number of awards and honors during her career, including, an NSF CAREER Award, a Washington University Graduate Student Senate Excellence in Mentoring Award, an Alfred Sloan Research Fellowship, and the Regitze R. Vold Memorial Prize from the Alpine Solid-State NMR Conference. Sophia is with us today to tell us about her journey through life and science. Sophia’s time away from science is spent with her family and her two newly adopted dogs. She enjoys sailing and skiing with her husband and 9 year old daughter. In the lab, Sophia studies the chemistry, physics, and engineering of materials we encounter in daily life like plastics and semiconductors. As a materials scientists, she is using a technique called nuclear magnetic resonance (similar to magnetic resonance imaging or MRI) to learn more about these materials. When she was young, Sophia was exposed to science in museums and programs like NOVA and Cosmos. Her intellectual curiosity was encouraged and she continued to take science courses through junior high and high school. Sophia actually didn’t take chemistry in high school, so starting off with chemistry freshman year of college with no background was daunting but she couldn’t resist the fields of chemistry and physics. Sophia’s lab is pushing the envelope on a lot of equipment, so they regularly encounter challenges. It’s not easy pushing the instruments down to temperatures of four degrees Kelvin (basically the temperature of outer space!) using liquid helium as a coolant. Any one thing might not be working on a given day and they sometimes have to pause an experiment until equipment can be repaired. In the world of NMR, very few nuclei (think photos or spectra) are studied. Hydrogen and carbon are commonly used, but Sophia’s group looks at exotic nuclei like cadmium, gallium, and aluminum. They recently completed a study on gallium which has some physical properties that make it hard to study. With the help of a great synthetic team got truly beautiful gallium spectra! A trip to Chamonix in the Alps for the Alpine Solid-State NMR Conference was her all-time favorite science travel experience. This was a small meeting with people from all over the world, and Sophia had extraordinary scientific discussions there. By the way, it is also in a breathtakingly stunning valley with great scenery, wonderful food, and excellent company. It was just like summer camp for scientists! When each graduate student in her lab passes their dissertation, they have a reception with cake and champagne. They also adopted a tradition from her time in Germany where each person receives a “doctor’s hat”. This graduation cap is elaborately decorated with inside jokes, a personal interests, and symbols of their science. The adornments of the hat are kept a secret until the big defense day. There is no way to make everyone happy all of the time. Sophia’s research focuses on using solid-state NMR to solve problems in materials science. She and her group study spins in semiconductors, using the unique combination of lasers and NMR (called “OPNMR” or optically pumped NMR). They work on problems in carbon sequestration and carbon dioxide capture to help reduce greenhouse gases in the atmosphere, using elevated-pressure and elevated-temperature NMR of rocks, minerals, and special solid-supported polymers. Sophia and her team also are part of a large NSF Center for Chemical Innovation (Center for Sustainable Materials Chemistry), conducting NMR studies of quadrupolar nuclei on inorganic metal oxide films envisioned for next generation semiconductor devices. 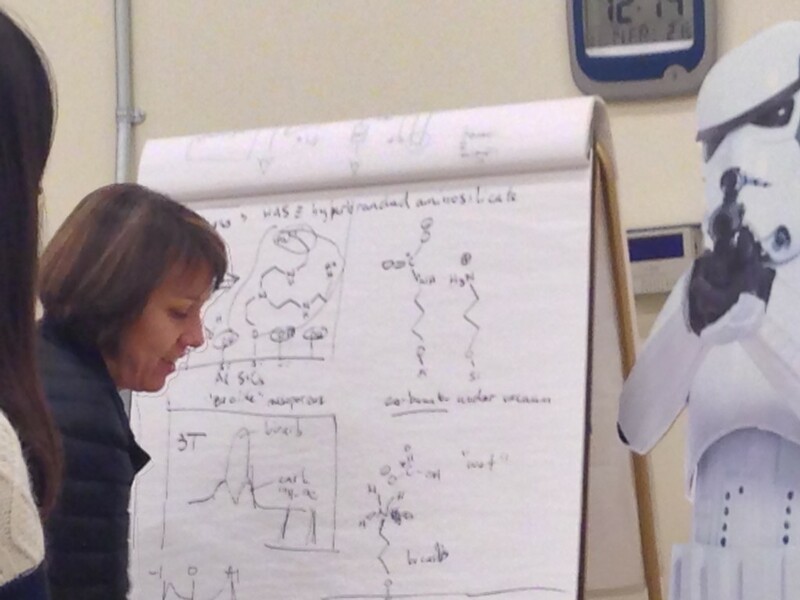 Here she is working on Jedi mind tricks while trying to draw interpretable organic structures for a Stormtrooper lecture on CO2 gas capture.